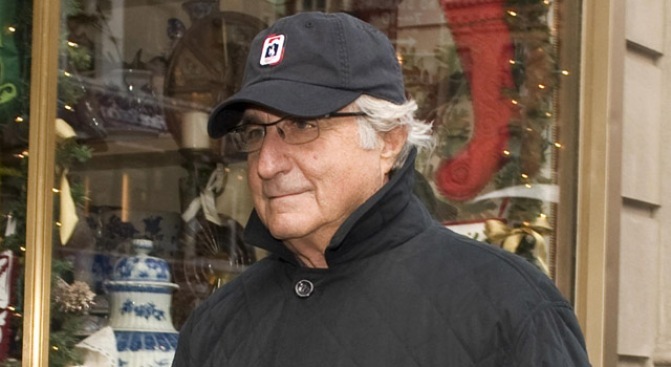 Bernard Madoff when he was still a free man. The 71-year-old has been sentenced to 150 year in prison. After losing nearly $2 million to Bernie Madoff, Cliff Bernie is still putting one financial foot in front of the other. The fabric store he and his father own sits alongside the 101 freeway in San Mateo, Calif. and for a while there, it seemed like the whole thing was going to get swept up in oncoming traffic. Back when the news came down that Madoff's investment portfolio was really just a gigantic Ponzi scheme, Cliff Bernie (yes, a bit tough to walk around with that name given the circumstances) saw his family savings and investments evaporated. Not down 40 percent like most of us. Gone. When we visited Bernie at the fabric store, though, he seemed upbeat. Madoff had just been handed a 150-year prison sentence, but that wasn't the reason: "No punishment can possibly fit that crime," he says. It's because his business was on the upswing. Turns out being a Madoff victim has actually helped sales. Bernie says he's been on the news a few times, and people now seek him out to shop at his store. Just this morning, I got an email from someone who had a big order to fill, and wanted to give his business to Bernie, after watching his story on the news. Bernie knows he's got little chance of seeing much of his money again. But he's moving on, rolling up carpet and selling lots of fabric. He thought he was going to have to sell his family's store, but now says he thinks he may be able to keep it. "Used to be Code Red, now it's Code Orange," he says. You may know someone who was victimized by Bernard Madoff. I've gotten to know this Bernie a bit, and while I, too, believe that money is just money, it's really hard to imagine losing all of yours - especially when you thought you were doing the right thing by investing it. It's nice to know that viewers have begun to root for the Bernie family store, both with their letters, and with their dollars. I'll be rooting, too. Scott Budman says if you need some fabric, the Norman S. Bernie Company is in San Mateo.